This sounds plausible Blog on business intelligence, performance management, philosophers in business by Wouter Trappers, information management consultant at Deloitte. 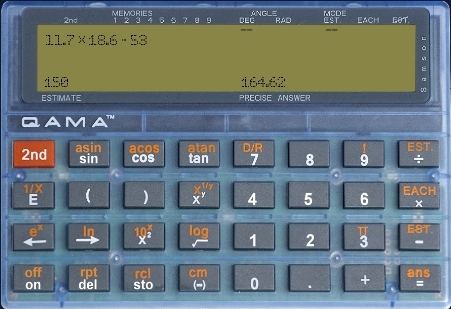 As a former math teacher I came across a very interesting jewel today: the Qama calculator invented by Ilan Samson. It lets you estimate the result of the calculation you want to solve, before giving the result. If the estimation is too far off, it simply doesn't compute. This way the users of the Qama calculator don't only need to be able to type in the right commands in the machine, but they also need to understand what they are doing and why. The same goes for BI projects. The business users of your dashboard or report should be able to eyeball any irregularities in the data. They should expect certain results and notice implausibilities at a glance. If the data goes against their gut feeling their first instinct will be to go with what they believe to be true, and question the data. Once the dashboard has earned the trust it deserves - of course it should deserve it first - the implausibilities and irregularities will be like nuggets of information-gold hidden in the data.